Sunglint is a phenomenon that occurs when sunlight reflects off the surface of a water body —like the ocean— at the same angle as an observer is viewing the surface. In the affected area, relatively smooth ocean water becomes a silvery mirror. 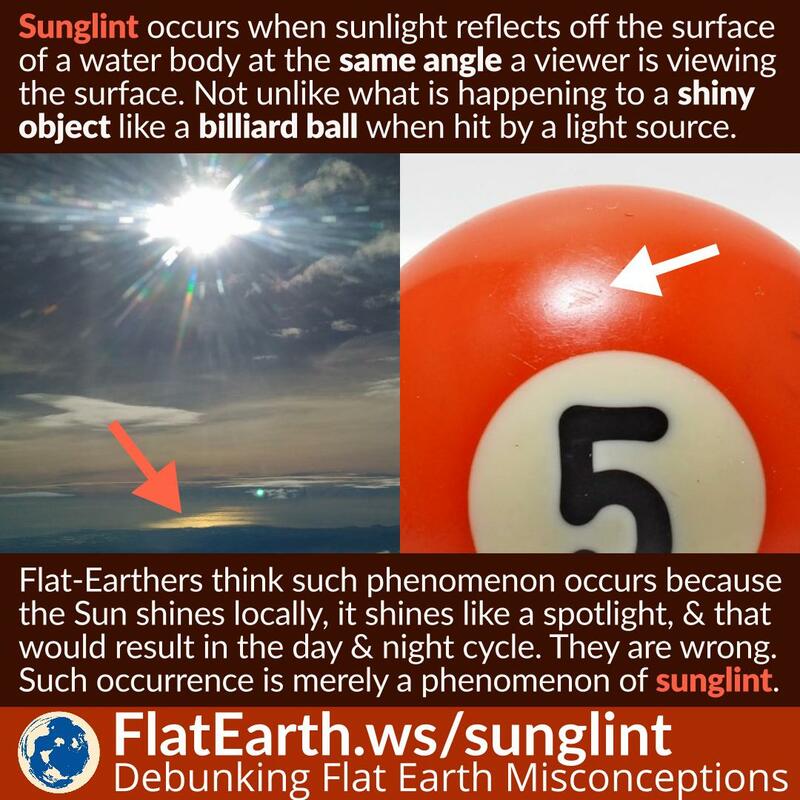 In the flat-Earth model, the Sun is assumed to be a ‘local light source.’ They like to use a spotlight or a flashlight as an analogy. They present the sunglint phenomenon as ‘evidence’ of the fact that sunlight is local. They are wrong. A similar phenomenon to sunglint also happens to any object with a smooth surface, like a billiard ball. Sunglint happens only on a water body. Landmass does not cause sunglint. The reason is that a smooth surface tends to reflect light to the same angle. It is like the difference between a paint job with a gloss finish and one with a matte finish. Sunglint is a well-explained phenomenon. It is not evidence of local sunlight. If the observer is close enough to the surface, and sunlight is coming from an angle almost parallel to the surface —like during a sunset— sun-glitter will occur. Sun glitter is mostly a lot of sunglints caused by the ripple of the water. The surface of the water is no longer smooth relative to the size of the projected Sun on the surface. The same thing would happen if we look at a smooth mirror under a microscope: the mirror will not look as smooth.